History: Like some other TAGS dogs, Slayer is from the Dodgem by Design/Gable Dodge line on his mother’s side and Fortress ancestry on his sire’s side. 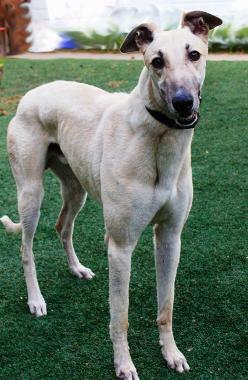 He is a good sized boy with a very distinctive look – light color, dark muzzle and big brown eyes lined with black. He has a fuzzy kennel coat, which he is blowing. He will have a more sleek look when the fuzz is gone. Slayer is from a 9-dog litter and like most of them did not race. In fact, he was injured during training and lost the outside toe on his right front foot. 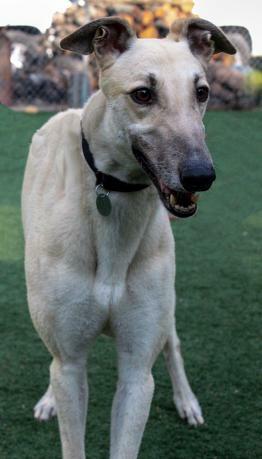 It certainly doesn’t slow him down or affect his ability to be a greyt pet. 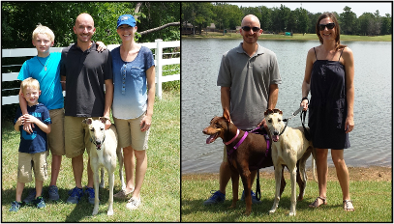 Slayer (now Vino) went to live in Texarkana with Jason, Kelsey, Gavin, Grayson, and Doberman sister, Rossi. August 03, 2013 update: Slayer was adopted to his lifetime home. Congrats to Slayer and his new family. June 25, 2013 update: Slayer is such a doll. 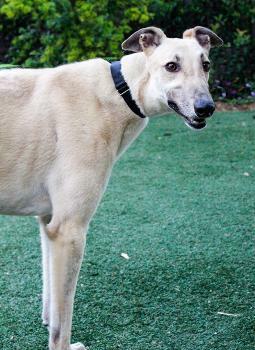 He is extremely easy going and gets along well with everyone here, including the 3 cats. He wasn't so sure about the crate at first, but he now runs in and waits for his treat. When he gets excited he lets out a deep "woof" to make sure we know he's excited. (Usually before meals.) He gets excited when the leash comes out and it's time for a walk. He bounces up & down with his front legs and spins in circles. 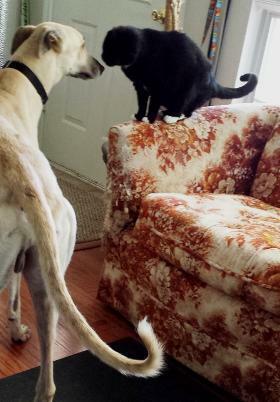 Slayer will be a greyt addition to his forever home. 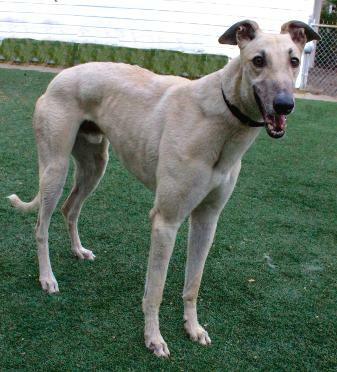 May 1, 2013 update: Slayer’s first day of his new life was eventful – which gives him some pause. 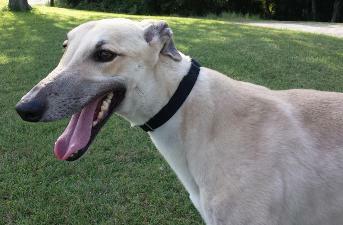 After being transported in two vehicles, he was introduced to five Greyhounds. He seemed to enjoy the familiar companionship. He is a little tentative, which is understandable. 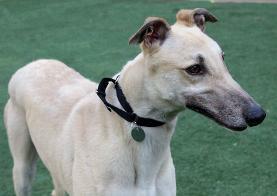 He was then taken on yet another car ride to meet two more Greyhounds, and he will be introduced to cats and small dogs. It may take a day or two for Slayer to settle in with them before we know his true reaction.